Clement XI, given name Giovanni Francesco Albani, pope from 1700 to 1721, was born in Urbino, on the 22nd of July 1649, received an extraordinary education in letters, theology and law, filled various important offices in the Curia, and finally, on the 23rd of November 1700, succeeding Pope Innocent XII. His private life and his administration were blameless, but it was his misfortune to reign in troublous times. In the war of the Spanish Succession he would willingly have remained neutral, but found himself between two fires, forced first to recognize Philip V, then driven by the emperor to recognize the Archduke Charles. In the peace of Utrecht he was ignored; Sardinia and Sicily, Parma and Piacenza, were disposed of without regard to papal claims. When he quarrelled with the Duke of Savoy, and revoked his investiture rights in Sicily (1715), his interdict was treated with contempt. The prestige of the papacy had hardly been lower within two centuries. About 1702 the Jansenist controversy broke out afresh. 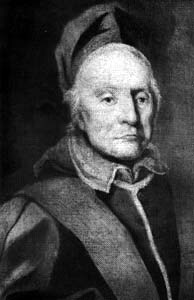 Clement reaffirmed the infallibility of the pope, in matters of fact (1705), and, in 1713, issued the bull Unigenitus, condemning 101 Jansenistic propositions extracted from the Moral Reflections of Pasquier Quesnel. The rejection of this bull by certain bishops led to a new party division and a further prolonging of the controversy. Clement also forbade the practice of the Jesuit missionaries in China of "accommodating" their teachings to pagan notions or customs, in order to win converts. Clement was a polished writer, and a generous patron of art and letters. He died on the 19th of March 1721.